Belief in God and evolution seems an easy option to some. But is the cost too heavy to bear? Originally published in Creation 17, no 1 (December 1994): 24-25. We may not be able to master a lot of complex arguments against theistic evolution, but among those who claim to be Christians, Jesus’ own treatment of Genesis closes the question. 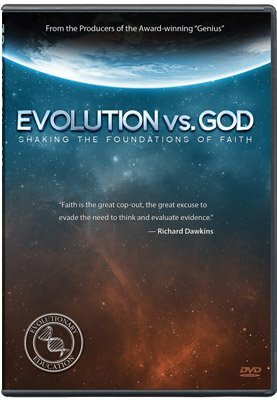 How many people do you know who are theistic evolutionists—meaning they believe in both God and evolution? When you stop to think about it, many of the people you know are. Most people, even if their idea of God is hazy, do believe in some kind of deity. And, if they haven’t thought much about it one way or the other, most do believe in evolution. So put the two together, and they come out as theistic evolutionists. Not that they would all use the term ’theistic evolutionist.’ I have met people who do not even know what the term means. ’Theistic’ comes from theos, the Greek word for God. So theistic evolution is the idea that God used evolution to create the world. Life supposedly originated from non-living chemicals, just as the atheistic evolutionist says it did, and all modern forms of life are thought to have then developed from the first one-celled organism by mutation and natural selection. The difference is that God supposedly created the initial materials and set up the natural laws, then guided the whole process. Theistic evolution has enormous appeal. It seems to offer the best of both worlds. It offers the comfort and fulfilment of believing in God, and at the same time the security of fitting in with the major scientific consensus. The difficult part about covering this topic is that there exist so many different forms of theistic evolution. It is probably no exaggeration to say that there is a different form for every theistic evolutionist around. Our approach here will be to group them in general categories, and to present the weaknesses of each. Which God in Theistic Evolution? We could set the various forms of theistic evolution on a continuum. If we put atheistic evolution on one end, the next would be some form of non-Christian theistic evolution. Then we come to a very minimal kind of Christian theistic evolution (God is no more than a distant First Cause who started it all). People in this group are quite liberal in their theology as well. Then we come to Christians who hold on to a relatively orthodox view of the Bible and theistic evolution. If we were to continue, the next group would be the old-Earth creationists, or progressive creationists, who believe God created the major kinds of living organisms, but that He did it over millions of years. Finally, separate from those above, are the young-Earth creationists, who believe God created the world in six literal days and that the Earth is no more than 10,000 years old. In accepting evolution, liberal theologians reject a number of key Christian beliefs. They reject the traditional date and authorship of many books in the Bible, which in itself represents a drastic undercutting of confidence in Scripture. If we cannot trust the Bible when it makes simple claims about when and by whom it was written, can we trust it when it makes much more important spiritual claims? If the Bible is full of errors, it obviously cannot be revelation from God. In treating the Bible as though it must be cut and patched to convey a ’true’ picture, liberal theologians are saying it is full of errors. If the Bible is full of errors, it obviously cannot be revelation from God. Where Did the Evil Come From? The Bible clearly tells us that evil, suffering, and death are real, so we are not escapist. However, evil is not intrinsic to the world. God created a good world. Evil entered by the free choice of individual human beings when Adam and Eve first sinned. So it is not contradictory to say that some day God will wipe out evil and sorrow. This teaching is both our hope for the future and our basis for fighting evil today. The theistic evolutionist loses all this. By denying the Fall, he loses the Biblical answer to the question, where did evil and suffering come from? Theistic evolution assumes that evil and death are intrinsic to God’s creation and have been there since the beginning. In other words, that God created them. God Himself is then the source of evil. But then God must be an evil God. To avoid this conclusion theistic evolutionists usually trivialize evil. This imperfect world is just a stepping stone to a better world which will evolve from it. Which brings us to the next point. If there was no Fall, why do we need redemption? If the problem is not our sin but our animal nature, then we only need to wait for evolution to raise us to the next stage. I was talking to a young woman recently who summed it up well. The answer is so simple, she said, that we often overlook it. Jesus treated Genesis as though it actually happened, so that settles it. We may not be able to master a lot of complex arguments against theistic evolution, but even a child can grasp this one. Among those who claim to be Christians, Jesus’ own treatment of Genesis closes the question. Conrad Hyers, The Meaning of Genesis: Genesis and Modern Science, John Knox Press, 1984. Cited in Bolton Davidheiser, Evolution and Christian Faith, Presbyterian and Reformed, Phillipsburg (New Jersey), 1969, p. 171.